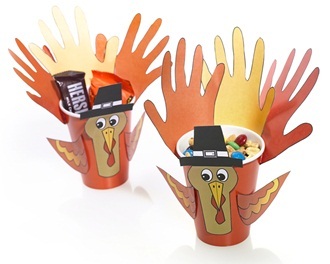 These adorable little turkeys are so much fun to make and perfect for your November celebrations! Start with 9 ounce cups in a fall color such as gold, orange or brown. Have kids cut out their turkey parts. Using a variety of colored papers, create feathers by tracing their hand and cutting out. Attach faces, wings and feathers with tape or glue.